Just press on the links ah mei, you could wait for a while and the links are usually in blue print. I love Quen Sonja ushering people in. Those two bowing/courtesying to each other. Prince Frederik and Princess Mary will always be my favourite from that night. There was so many beautiful gala dresses and tiaras. My favorite gown is Mary's red velvet dress. She looked incredibly regal. 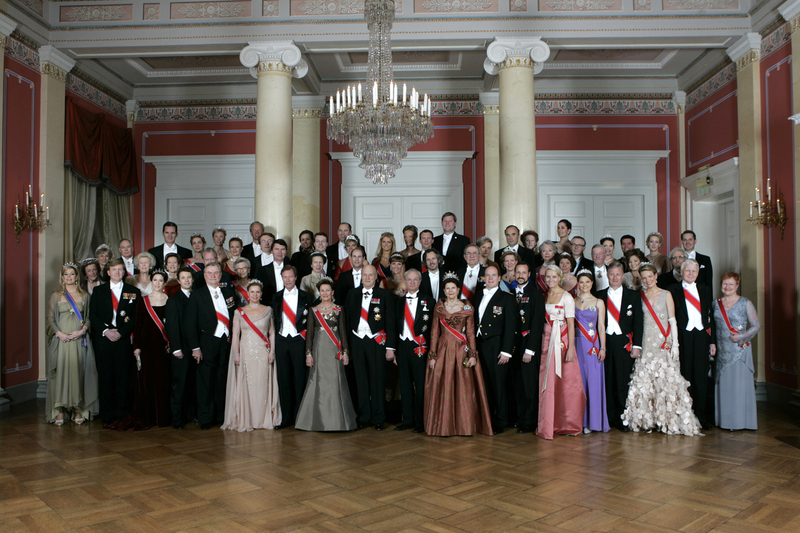 I also loved Victoria, Mette Marit, Silvia, Maria Teresa, and Maxima's gowns. I thought Mathilde's dress was awful. You are a wealth of information and I so get to enjoy all those pictures and jewels. I agree Mary was the very best, that red gown is gorgeous on her with her dark hair and complexion. I did not see Queen Max there in the picture for I like her gowns. And the gown on Queen Mathilde, not a good choice, that was something like it came from a beauty pageant. I also like the gown on Queen Sonja, that style really suits her and the color was so nice to see something beside bright colors that she seems to like. Who's the lady wearing a tiara behind Lorentz and Christina? Worth noting is Christina in her now stolen tiara and Desirée in the tiara that's been under discussion in other threads the last few days. Viscount Anson. Her tiara is an heirloom of Princess Viggo of Denmark. There is a replica of this tiara worn by the Vind/Rosenborg Family , descendents of Prince Erik of Denmark. Alexandra who married Ivar Vind and Christian of Rosenborg who married Karin Luttichau , former Lady in waiting of Princess Benedikte. Prince Erik is Prince Viggo's brother.